No appointments needed. Open seven days a week, all year long, including holidays. 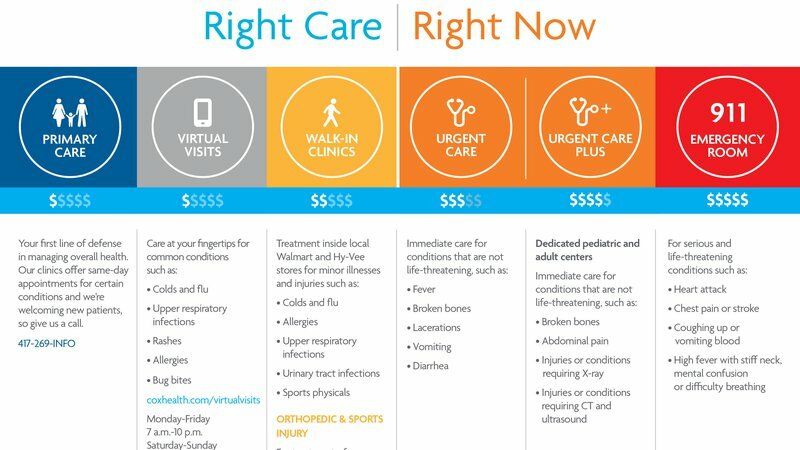 Urgent Care Plus at The Turner Center in Springfield offers urgent care for conditions and injuries that aren’t life-threatening, such as broken bones, sprains, fractures, cuts, certain infections, rashes and more. Our facilities are staffed by board-certified physicians and a specially trained nursing staff. As a hospital-based location, CoxHealth Urgent Care Plus also offers access to additional resources such as ultrasound and CT scans, as well as providing convenient access to the hospital’s emergency room services, if needed. With advanced laboratories and diagnostic imaging technology, there is no need to go from place to place to complete your care. If a higher level of care is needed, immediate transport is available.